A music student from the age of four, Tara Anand Bangalore (b. 1964) has a deep knowledge of Carnatic (South Indian classical) music, one of the oldest music systems in the world. Though the violin was first introduced to southern India in the 18th century as a supporting instrument, the violin steadily gained importance, and by the 20th century was considered a prominent instrument featured in solo recitals. The building blocks of Carnatic music are talas (rhythmic cycles) and ragas (melodic scales). As is customary, Tara learned directly from prominent gurus (teachers) in Delhi. She is one of the most sought after teachers of Carnatic music in the Boston area. She was awarded the Best Teacher award at the Cleveland Tyagaraja Aradhana Festival, a competition festival t5hat has become the gold standard for awarding young musicians of the highest caliber. Suhas Rao (b. 1990), who grew up in Boston's western suburbs, has been playing the violin since he was six years old. 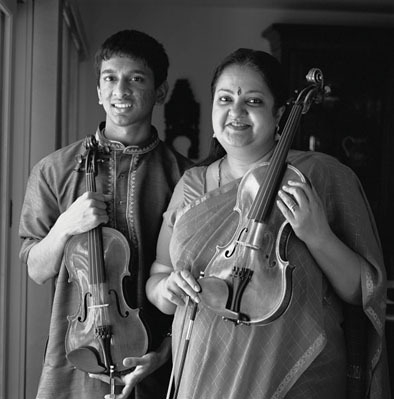 Although his musical training began in the Western classical style, his parents introduced Suhas to Carnatic music by taking him to a concert at a local temple performed by Tara. He has been studying with her ever since. Suhas says "Since I was born and brought up here, I have to work extra hard to maintain a connection to Indian cultural here in the United States. Carnatic music has been the link that has tied me to my identity as an Indian." Tara notes, "Suhas is a very exceptional player. He is one of those students that comes along only once in a lifetime." When asked to describe his guru's teaching style, he answers, "She's strict but still fun at the same time. She is very encouraging." They were awarded an MCC Traditional Arts Apprenticeship in 2007.